A Comprehensive school is a secondary educational institution that teaches an inclusive range of subjects across the academic and vocational spectrum. The most significant attribute of comprehensive schools is that they do not select students based upon academic aptitude. While comprehensive style schools are frequently found across the world, such as the multipurpose American high school, Europe remains one of the few regions that have continued to use a mixture of comprehensive and selective based schools. The countries of United Kingdom are some of the few European nations to transition to an almost entirely comprehensive structure. While some continue to support the idea of selective education, with the academically gifted receiving education appropriate for tertiary education at the university level while others receive vocational education or a general education, for many this system is regarded as elitist and unfair. Finding a way to assess the best education for each individual, unique in their talents, abilities, and interests, without discrimination and elitism, is essential to the health of future societies. The comprehensive school, responsible for all children within a given geographical area, has the challenge of how to do this. Comprehensive schools are designed with the belief that to achieve a well educated public schools need to be of a large size and to take children of various abilities, in addition to teaching a wide range of subjects. Comprehensive schools share a similar foundation to the Liberal arts movement, in that both are structured to develop general knowledge and intellectual skills, rather than more specialized occupational, scientific, or artistic skills. Children are automatically accepted into a comprehensive school if they satisfy non-academic criteria such as age and geographical location of residence. There is no admissions criterion based on academic aptitude. Within the school, however, students may choose or be streamed into different programs of study. Also, progress through the program is based on achievement. Thus, the purpose of the comprehensive school is to provide equal educational opportunity to all children within the local area without selective admission procedures. While comprehensive education is the foundation of all public secondary education in the United States and many other industrialized regions of the world, historically comprehensive schools were not widespread in Europe but rather followed a selective approach to education. Prior to the nineteenth century in many European countries schools were private, established by individual benefactors or by the church. Fees were charged and only the wealthy received secondary education. When the state became involved in the construction of schools, selectivity continued. Only the students showing the best academic aptitude went on to study secondary education subjects, as these were seen as preparation for higher education. The others entered the work-force, vocational education, or an apprenticeship. After the Second World War, secondary education in England, Wales, and Northern Ireland was provided free to at least the age of 18 and managed under the Tripartite System introduced by Conservative secretary of state for education Rab Butler. According to this system, secondary schools were of three tiers: grammar schools, secondary modern schools, and technical schools. Students were assigned to one of these types of school based on their scores on the Eleven plus exam, taken at age 11 at the completion of primary education. Only grammar schools focused on providing preparation for higher education. Independent (fee-paying) schools continued to offer university preparation programs for those students with sufficient financial resources. Comprehensive schools were introduced as an alternative to this selective system. While local districts were not forced by law to create comprehensive schools, they were encouraged to do so, and thus the two types of schools existed in the United Kingdom for many years: traditional and comprehensive. Holyhead High School a.k.a. 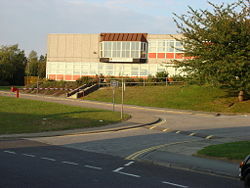 Ysgol Uwchradd Caergybi High School. The school was formed in 1949 with the amalgamation of Holyhead Grammar and St Cybi Secondary school. Early comprehensive schools modeled themselves firmly on the grammar school, with teachers in gowns and lessons in a very formal style. The first were formed using existing school buildings. In 1954, Kidbrooke School opened in the London Borough of Greenwich as the first purpose-built comprehensive school in Britain, although the teaching style remained traditional. The opening of the Risinghill Comprehensive School in Islington in 1960 offered an alternative to this model. Embracing the progressive ideals of education, the school abandoned corporal punishment and brought in a much more liberal attitude to discipline. The largest expansion of comprehensive schools resulted from a policy decision taken in 1965 by Anthony Crosland, a fervent supporter of comprehensive education, who served as secretary of state for education in the 1964-1970 Labour government. The policy decision was implemented by "Circular 10/65," an instruction to local education authorities to plan for conversion. Over that ten-year period many secondary modern and grammar schools were amalgamated to form large neighborhood comprehensives, whilst a number of new schools were built to accommodate a growing school population. By 1968, around 20 percent of children attended comprehensives, and by the mid-1970s, the system had been almost fully implemented. Nearly all new schools were built as comprehensives, and existing grammar and secondary modern schools were either closed or amalgamated with neighboring secondary moderns to produce comprehensive schools. By the end of the twentieth century, comprehensive schools had become the most common type of state secondary school in England, and the only type in Wales. Comprehensive schools usually serve a geographical neighborhood, taking their students from a defined local "catchment area." All comprehensive schools take pupils from the age of 11 to at least 16. Although comprehensive schools take in all students despite ability, once enrolled in the school student are often grouped by aptitude so as to create clearly defined levels of education. This may be done through evaluation of past grades or testing. Those who seem better suited to academic study may take more advanced courses, while other students may take those that progress at a slower pace. Schools may also use streaming to group children by ability within individual subjects. Some comprehensive schools have a sixth form, with some pupils taking A levels, whilst others follow vocational programs. Some comprehensive schools are designated as specializing in a particular area. For example, the Plant Hill Comprehensive School, an early purpose-built comprehensive school in Manchester, was awarded specialist status and became Plant Hill Arts College. This has allowed both specialization in the Performing Arts, Visual Art, and Media Arts and the integration of these areas into classes across the curriculum. Most European nations other than those of the United Kingdom have secondary educational systems that mix selective and comprehensive schools. Below is a brief description of a few of these. Secondary education in France is a combination of selective and comprehensive in style. Compulsory secondary education in France ends at the age of 16, usually after completion of Collège. A majority of students go on to attend a Lycée, the second stage of secondary education, which is structured in a comprehensive manner but entrance is based upon achievement and successful completion of the collège curriculum. Such success includes an examination, but also the evaluation of a conseil de classe (class council), comprised of teachers, administrators, and fellow students. baccalauréat général - Prepares students to enter higher educational institutions. baccalauréat technologique - Short-term studies in differing technology fields. baccalauréat professionel - Vocational qualification leading directly to a particular career. Public French universities are required to accept any student who attains the baccalauréat général. However, in selective fashion, there are also Grandes écoles, elite higher education establishments which function outside of the public university system, that traditionally have produced France's highest ranking politicians, executives, and scientists. Entrance to these institutions requires classes préparatoires aux grandes écoles, two to three-year courses, often offered by historical, prestigious, and selective lycées. In Germany secondary education is selective, in that students are placed into different types of schools based upon their abilities. Usually the students that attend a Gymnasium school in Germany are the most academically strong students upon leaving primary school. The Gymnasium school helps to prepare students to enter a university, and is the most rigorous and prestigious level of secondary education in Germany. Those students who are not qualified to enter Gymnasia attend one of the three other types of German secondary schools: Realschule, Hauptschule, or Gesamtschule. The Realschule has a broader range of emphasis for intermediary students; the Hauptschule prepares pupils for vocational education, and the Gesamtschule are structured in comprehensive fashion without streaming by ability and offer all types of programs. Although including a selective component, the German system with the existence of these different types of schools ensures that all students have a place to study. Most students in the Republic of Ireland attend and complete secondary education, with approximately ninety percent of school-leavers taking the terminal examination, the "Leaving Certificate." Comprehensive schools were introduced in 1966 by an initiative by Patrick Hillery, Irish Minister for Education, to give a broader range of education compared to that of the vocational school system which was then the only system of schools completely controlled by the state. Other types of schools, known as "voluntary secondary schools" were controlled by religious authorities. Today, secondary education may be completed at a "community school," a comprehensive school, a vocational school, or a voluntary secondary school. The community schools offer both academic and vocational programs, and facilities are broader than at voluntary or vocational schools. These facilities are also available for use by the community and adult education. The comprehensive school system is relatively small and has to some extent been superseded by the community school concept. Scotland has a very different educational system from England, although also based on comprehensive education. It has different ages of transfer, different examinations, and a different philosophy of choice and provision. Pupils remain at primary school for seven years. Then, aged eleven or twelve, they start secondary school for a compulsory four years with the following two years being optional. The school leaving age is generally 16 (after completion of Standard Grade examinations), after which students may choose to remain at school and study for more advanced examinations that are required for entrance to university. All publicly funded primary and secondary schools are comprehensive in type with no selective admissions. Supporters of comprehensive education argue that it is unacceptable on both moral and practical grounds to select or reject children on the basis of their ability. They also argue that comprehensive schools in the UK have allowed millions of children to gain access to further and higher education, and that the previous selective system relegated children who failed the eleven plus examination to a second class and inferior education, effectively denying them the possibility of higher education. Critics of comprehensive schools argue that the reality has been a leveling down of provision and a denial of opportunity to able children from disadvantaged backgrounds, who might once have expected to pass the eleven plus exam and have the advantage of a grammar school education. Under the comprehensive system, in order to ensure that their children attend what is perceived to be a "good" school parents purchase a house within the catchment area of that school. This has led to selection by financial means of parents rather than the academic ability of the students, albeit measured imperfectly by their ability to pass particular exams. Such differences in opinion is one of the reasons many European nations chose a mixed system. While Europe overall has an excellent educational system, there are many areas that continue to be debated, including the use of comprehensive and selective schools. ↑ 2.0 2.1 J. R. G. Tomlinson, "Comprehensive Education in England and Wales, 1944-1991," European Journal of Education 26(2) (June 1991): 103-117. ↑ H. D. Lewis. The French Education System. (London: Croom Helm, 1985, ISBN 0709916833). Tomlinson, J. R. G., "Comprehensive Education in England and Wales, 1944-1991," European Journal of Education 26(2) (June 1991): 103-117. All links retrieved March 15, 2017. Comprehensive system is flawed, thinktank to be told guardian.co.uk. Comp, a BBC Radio 4 documentary about the creation of comprehensive schools. Comprehensives under attack BBC News. Educational Inequality and Sociological Models arasite.org. This page was last modified on 15 March 2017, at 15:19.